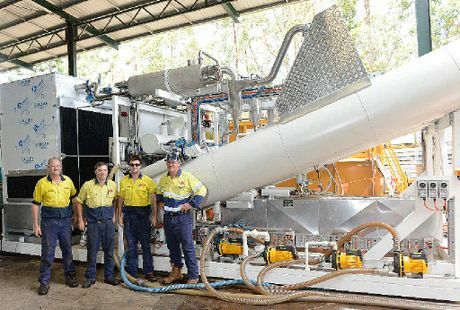 A REVOLUTIONARY new machine designed and built in Gympie is set to change the way mining companies think about toxic waste water. Ali Jak, named after inventor Jason McPherson's children, uses "dark science" to turn once unusable CSG frack water and drill mud into clean water that can be used to water stock and irrigate pastures. Mr McPherson was putting his world-first commercial unit through its paces at CPM Engineering yesterday, turning muddy salt water into fresh water. He has taken out world-wide patents to protect his intellectual property and the invention has captured the attention of mining companies world-wide. "It's my baby," Mr McPherson said. "It's designed on a hail cloud." ALI JAK: Gympie inventor Jason McPherson (right), from CPM Engineering, stands in front of his creation Ali Jak with Ron Smedes, Matthew Grady and Michael Bryers.RIGHT: Treated water samples. He said the environmental forces in hail clouds separated water and dust, making hail one of the purest forms of water. MR McPherson's machine creates similar conditions inside long cylinders to extract clean water. "It's the simplest way for me to explain it," he said. Ali Jak heats and cools waste under different pressures in 27 separate stages until the water is atomised and taken out as a vapour. The leftover solid waste is them mixed with organic matter to make fertilizer. A prototype has just finished a successful nine-month trial onsite at Wondai. "It's amazing," Mr McPherson said. "There is nothing close to what we are doing any where in the world." "There hasn't been any type of waste water the Ali Jak can't handle." Comprehensive third party testing, by URS, confirms Mr McPherson's claims. "I'm yet to find something we can't treat," he said. The machine has many benefits for the mining industry. Because it can recycle 70,000 litres of water a day, it saves expensive trucking of waste and water on and off mine sites. It also has many positive environmental effects. It alleviates the need for waste water to be kept in evaporation ponds and toxic waste to be buried. "This is my biggest chance to make a difference to the environment," Mr McPherson said. But he can also see his machine having a humanitarian impact. 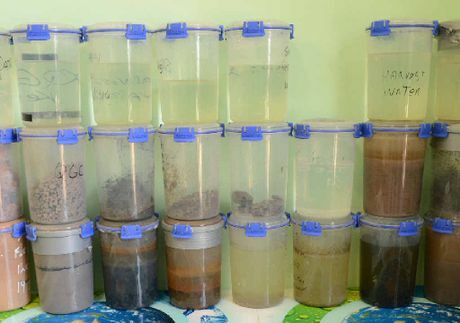 "I like to see third world countries and refugee sites taking waste streams that cause infection and turning them into clean water and dried waste that could be used as fertiliser to grow food." But most of all, he wants to keep the whole operation in Gympie to provide jobs for locals.